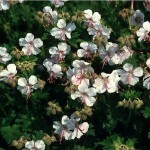 The Perennial Plant Association (PPA), annually names an outstanding plant its “Perennial of the Year.” The 2015 selection is an easy-to-grow hardy geranium groundcover (spreading) perennial, Geranium x cantabrigiense ‘Biokovo’, which is a cultivar that is native to the Biokovo Mountains in Croatia. It is said to be hardy in zones 4-8. It begins blooming in late spring, lasting through summer, with tiny white-petaled flowers, tinged slightly in pink. 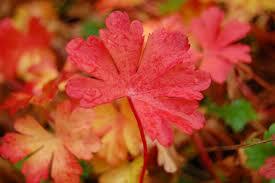 Its semi-evergreen rounded foliage is medium green and aromatic, turning red or orange in fall. (The aromatic foliage suggests it is likely somewhat deer resistant). 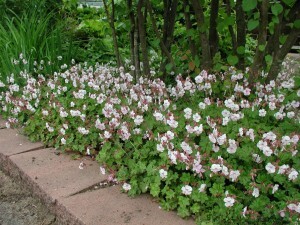 The plant spreads by rhizomes, and it is useful where groundcover is needed to cover a sizable area, e.g., along the front of a border; it is recommended for rock gardens. The plant grows well in full sun to partial shade. It will likely do best in a spot protected from hot afternoon sun, such as an eastern exposure. The plant grows to about 10″ in height, and it will spread about 2-3 feet. It can be divided every few years if needed. It is mat-forming, and it can be controlled very easily if necessary. It seems like a nice plant to grace the base of a mailbox close to the road. For the second year in a row, the PPA selection is a plant that I have not grown previously. The 2014 selection was Panicum virgatum ‘Northwind’, and based on the PPA designation, it was widely available in nurseries this year. I used it for the first time, and I was delighted that it lived up to its hype. It is an ornamental grass that I will continue to recommend when a good upright, fiarly large, ornamental grass is needed. I am hopeful that the Biokovo geranium will likewise be a pleasing addition to landscapes in our area, and I plan to add it to my repertoire of flowering spreading low-growing groundcovers with nice foliage color, for sunny areas, where I’ve used plants such as Plumbago, Dianthus, and Sedum.